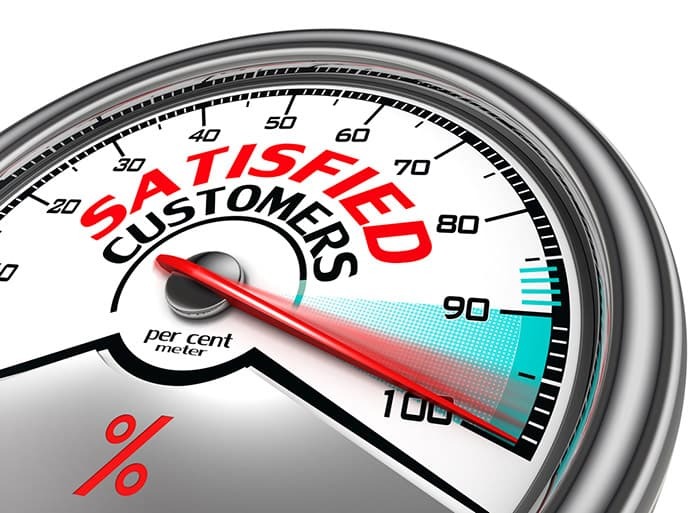 You may be surprised to know that 96 percent of dissatisfied customers do not complain. However, 91 percent of those unhappy people will never buy from you again. Your top priority is to keep your customers happy. But how can you tell if your customers are satisfied with your products and services? It’s not as straightforward as it may seem, but there are some very useful methods and metrics available. Here are a few that you can start applying to your business right now. Email survey: An email survey is a good way to get an in-depth insight into your customer happiness. Although they have a lower response rate than other methods, they allow your customers to answer multiple questions. In-app survey: For this method, you need to integrate a feedback bar on your website. An in-app survey will usually consist of just one or two questions. Service survey: This type of survey focuses on customer service or a delivery. The survey is taken immediately after the service was provided and can be done by email or live chat. The standard customer satisfaction metric is to ask your customers to rate their satisfaction with your service, product, or business on a scale of 1-5 or 1-10. The advantages of this metric are its simplicity and its directness. The disadvantage is that customer satisfaction can be hard to rate, even for the customer. The NPS measures the customers’ probability of referring your company to someone else. This is the most common way to gauge customer loyalty. Each customer is asked how likely he or she is to recommend your business on a scale of 1-10. The NPS is easier to answer than the customer satisfaction survey because it’s about the customer’s intention to refer rather than their emotional satisfaction. This data can easily be gathered using in-app or email surveys. This metric analyzes the effort it took to get the customer’s issue resolved. It is typically measured on a scale of 1-7. Market research shows that customers with a high effort score show a reduction in loyalty down the line. You need to aim for as low of a CES as possible. Allowing your customers to express their feelings about pricing will give you useful information, not only about how they feel about the total price of your products or services, but also how they feel about their value for the money. It essential that you evaluate complaints thoroughly every time you receive one. You can also broaden your analysis by checking out unsolicited feedback in online reviews and social media. When a customer contacts you with a specific issue, always get back to them and provide a possible solution quickly to restore their happiness. The impact that social media has had on the relationship between customers and businesses cannot be overemphasized. This is mainly due to the fact that it enables customer experience to be shared with a much wider circle than ever before. That means it’s the perfect platform for you to find out how your customers feel about your brand. Facebook and Twitter are the obvious platforms but don’t forget the other ones like Yelp, Quora, and TripAdvisor. It’s also worthwhile to sign up for Google Alerts, as this will notify you when your brand is mentioned online. You should also try out Socialmention. It’s a free tool that analyzes mentions of your brand in social media. It will give you information on the likelihood of your brand being discussed online and the ratio of positive to negative mentions. Once you have your customer satisfaction metrics in place, you need to make sure as many customers as possible are using them. Asking customers for their opinion will make them feel valued, but some people just don’t want to spend the time. This is where it helps to offer incentives. For example, adding a coupon, reward or additional information will often encourage them to participate in an online survey. This is a valuable checklist to help you get started with measuring your customer satisfaction. If you are struggling to come up with a survey that you think is right for your business, you will find many templates and suggestions online. Get started on satisfying your customers right now!